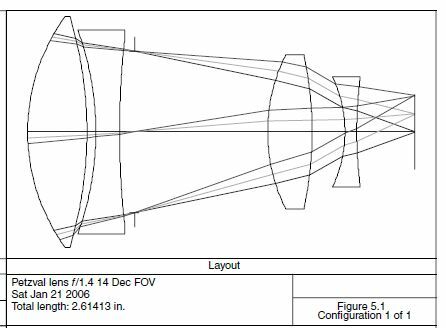 Fast optics: since the goal is typically to capture large, diffuse, and dim objects (usually nebulae), focal ratio is key. Quality optics: stars should be sharp to the corners, it should be truly apochromatic, and the field is evenly illuminated. A good focuser: the zone of critical focus is very narrow at fast focal ratios, so any focus shift is unacceptable. Living under light-polluted New Jersey skies, my preference is to shoot narrowband objects, as that negates most of the effect of the light pollution. I have an affection for small refractors, and I particularly enjoyed having a Borg 77EDII, which was a super-fast f/4.3, until I recently sold it. 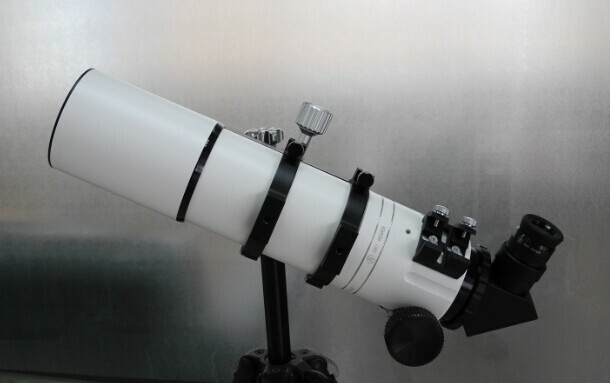 There’s something nice about the simplicity of small refractors. They are light, easy to balance, easy to align. Give me a fall evening, a wide-field scope, and a camera set up for narrowband imaging, and I’m happy. The William Optics Star 71 recently caught my eye as a replacement for my old Borg 77. I signed up for the pre-order, and Agena Optics delivered my scope this week. The WO Star 71 has a stated focal ration of f/4.9 and a focal length of about 354 mm* (though this is not explicitly stated anywhere I can find), which nicely frames many large showpiece objects on common sensors. For an APS-C sized sensor, the field of view is 3.6 x 2.4 degrees. 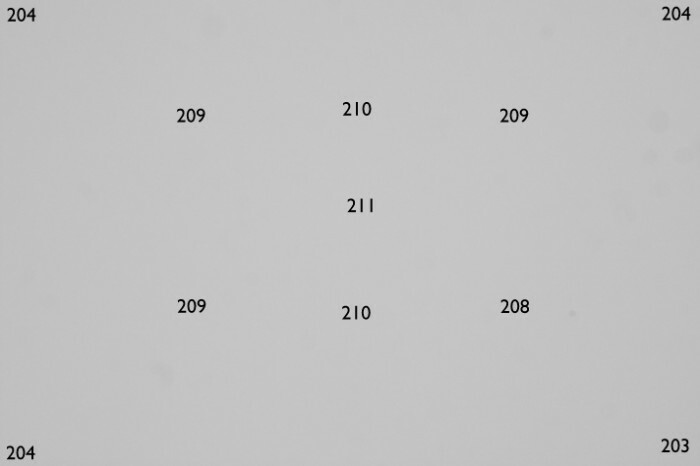 For a 4/3 format sensor like the KAF-8300, the field of view is about 2.9 x 2.2 degrees. I plan to use it mostly with the ST-8300, and this field of view nicely frames a lot of narrowband targets I’m after this year. The evening I got the scope, it was actually clear. Now, it was a lousy night for imaging because it was over 80 degrees, the winds were gusting, and high humidity made for terrible transparency. Worse, the waning gibbous moon would only allow for about two hours of dark skies. So it was a terrible night for imaging… but perfect for taking a few test shots. Before it gets dark, let’s have a look at the scope. This is classic William Optics: white and gold. The focuser has a thermometer–neat, but I’m not sure how much I’ll use that. The scope comes with a nice pair of rings, a Vixen-style dovetail, and a M48 to Canon adapter. So even visually, it’s clear that this is an imaging scope. The focuser terminates in M48 threads, not a 2″ eyepiece holder. (Note, that’s M48, not the standard T-thread of M42.) If you want to use this scope for visual use, you have to buy a special adapter, which is fine with me, because imagers prefer to keep all the connections threaded. 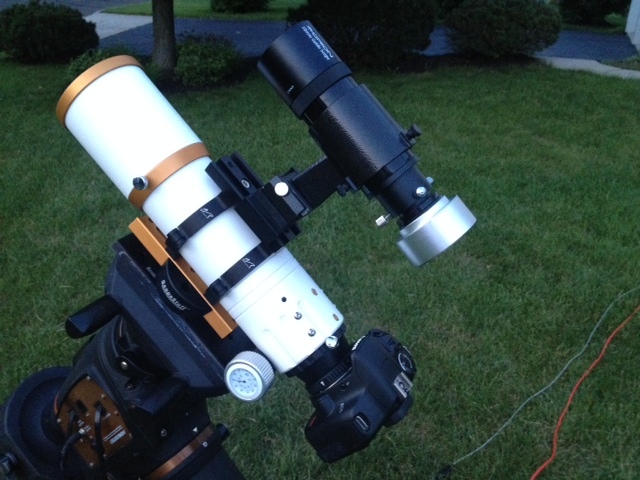 For scale, you can see the Orion 50 mm guidescope mounted on top, and the Canon 450D/XSi DSLR. For a 71 mm scope, it’s actually pretty big. I don’t have my Borg 77EDII anymore, but I’m almost certain this is bigger. What you can’t see in the photo is how heavy the scope is. WO claims it’s 5.3 lbs with the rings, and that seems about right, but until you handle the scope, you don’t realize how dense that is. There is clearly a lot of glass in there, and not just at the objective end. It’s the same impression I got the first time I picked up my Tak 106ED. This thing is solid. WO notes that FPL-53 glass is used, and that there are a total of five elements in three groups. People seem to attribute almost mystical powers to FPL-53, and while it is found in the best optics in the world, the glass type doesn’t matter if the elements aren’t well matched or poorly figured. But between the weight and glass type, we’re off to a good start. Let’s get down to brass tacks. How did it perform for imaging? Bear in mind that this was just a chance to take some quick test shots, so hopefully I’ll be able to do more extensive imaging work with it later, but first let’s check the overall field of view with a DSLR. 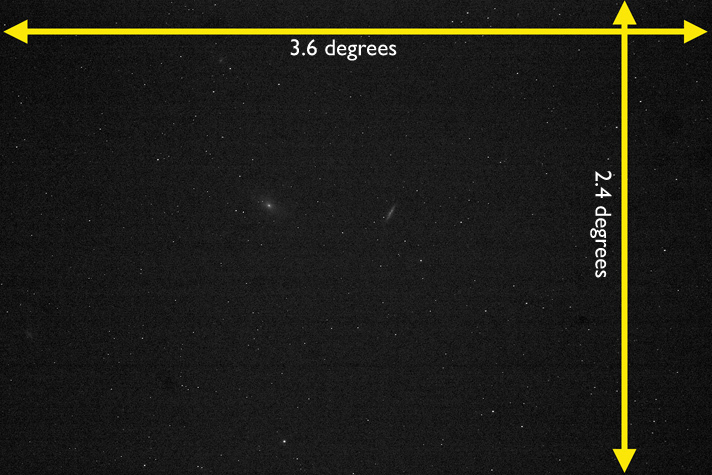 This is a single 30-second exposure of the area around M81 and M82, just to give a sense of scale. Yeah, that’s a wide field. These are 200×200 pixel areas from the edges and center. The stars are sharp, and that’s a pretty flat field, especially for f/4.9. This substantially outperforms my old Borg 77EDII (though to be fair, that scope was f/4.3 and not known for exceptional flatness of field or perfect apochromatism). It’s probably not as good as the Tak 106ED at f/5.0, but it’s slightly better than the Tak at f/3.7. What about vignetting? WO claims the scope will deliver a 45 mm usable imaging circle. That would be large enough for a full-frame 36 x 24 mm sensor. That’s always a bit of a judgement call, because the manufacturers never seem to state what level of light falloff is acceptable in determining the size of the usable imaging circle, but okay. An APS-C sensor needs about a 27 mm circle, so that’s all I can test for now. I took a flat frame, and then I measured the 8-bit brightness level at the corners and in the center. I’m sure someone with CCDInspector could provide a pretty 3D map, but this method will tell you what you need to know. The flat field image was exposed to stay in the linear range of the sensor, and we can see that there is only about a 3-4% falloff from the center to the edge. That’s really good. All right, final test… what about apochromatism? Do all the colors come into focus at the same plane? Sorry, I’ll have to update this review later with that information once I get a full night out with this scope and my ST-8300. And what about the focuser? I monitored focus through a Bahtinov mask, and as expected, focus is really touchy at f/4.9. The critical moment came once I had lined up focus and turned the focus lock knob. This is where cheap focusers will suddenly throw the image out of focus, leading to an annoying game of “How far out of focus do I need to start so that it will be in focus after tightening?” (Oh, you’ve played that game, too I see.) In fact, I used to have an early Zenithstar II from William Optics whose focuser was… well, it kinda sucked. And judging from comments on forums, WO has had some challenges with their focusers. The Star 71′s rack and pinion focuser performed well. The image stayed in focus after tightening the locking knob. I have to say that the focuser does not feel as tight as a Moonlight or Feathertouch, but it did the job admirably. My initial impressions of this scope are very good. I’m really pleased so far, and I hope to provide a fuller review with images at a later date. The dew shield only extends 1.5 inches past the objective lens cell. This is too short, especially for those of us in humid climates. And I’m not sure how I feel about the price of $998. ($898 for the first few sold.) I know this is a new, patented optical design. And the optical performance looks really good. And it’s f/4.9. But it’s also only 71 mm of aperture. The price compares well to the Borg 77ED or 71FL, and the Televue 76. But WO sells their own Zenithstar 71 + 0.8x focal reducer for $568, and that would be an f/4.9 system as well. Granted, I don’t know if the field is as flat, the optics are as sharp, or the focuser as good, but it makes for an interesting comparison at over 40% less. To be fair, WO explicitly notes that the Star 71 is a “[n]ew, unique, patented design – not a conventional objective/flattener/reducer design.” But having another 71 mm f/4.9 scope out there plants a little seed of doubt. I have a unique consideration when reviewing this scope. I originally ordered two with the plan to create a dual-scope narrowband imaging set-up. I reasoned that I only get a few nights a month of decent weather, so why not double up on the exposure time with two scopes? But I’ve had a hard time finding another used ST-8300, and once I started pricing everything I’d need, I started to chicken out and reduced my order size to one scope. (Oh, so that’s why no one seems to be imaging with a dual-scope setup…) So the question for me now is not whether I’m keeping the Star 71 (I am), it’s whether I’m going to buy another one.